Within the area of carbon based refractories, phenol-formaldehyde (Phenolic) resins have found a multitude of uses. One significant attribute of phenolic resins is their ability to form a carbon bond. This, to a large extent, contributed to their initial use in this Industry, as cleaner alternatives to the traditional pitch and tar binders. Also as the industry increased usage of carbon bonded products, phenolic resin bonded products have replaced more and more the traditional ceramic bond in many areas of liquid metal contact. Phenolic resins can also dramatically improve production rates and consistency of refractories. Their low temperature curing characteristics give dimensional stability, and in many applications, the final heating of the product to form the carbon bond, can be carried after the product has been installed at the customer. They have excellent compatibility with many refractory raw materials, and give good adhesion to both oxides and graphite. Also, being a synthetic product, close quality control during manufacture gives a binder with consistent performance not only during refractory manufacture, but also in service. The terms carbon, formed carbon, manufactured carbon, amorphous carbon, or baked carbon refer to products that result from the process of mixing carbonaceous filler material particles such as calcined anthracite coal, petroleum coke, or carbon black with binder materials such as petroleum pitch or coal tar, forming these mixtures by moulding or extrusion and conventionally baking these formed pieces in furnaces at temperature from 800 deg C to1400 deg C to carbonize the binder. Conventionally baked carbon can be densified, and thus its permeability improved by the introduction of additional binders impregnated into the baked carbon under vacuum, and the resultant product re-baked to carbonize the impregnation. Multiple impregnations are possible to double or triple densify the end product. Each densification, however, adds to the cost of producing a denser product. Some manufacturers also add special raw materials to the carbonaceous mix prior to baking to improve the end-product properties. Silicon carbide or silicon metal can also be added to improve permeability and abrasion resistance. Hot pressed carbon is also a product containing carbon particles with a carbon binder but with a different manufacturing process. Unlike conventionally baked carbons that can take weeks to bake to volatilize the binders, this process of manufacturing carbonizes the binders in minutes. In this hot pressing process, a special pressing/carbonizing method is utilized. The carbon particles and binders are mixed as before but are introduced into a special mould in which a hydraulic ram pressurizes the mixture while, simultaneously, an electric current is passed through the mould, carbonizing the binders. More importantly, as the binders volatilize, the hydraulic ram compresses the mixture that closes off the pores formed by the volatilizing gases as they escape. The resultant product is a very impermeable carbon that can be approximately 100 times less permeable than conventionally baked carbon. This impermeability is an important property that prevents furnace contaminants such as alkali and zinc vapour from penetrating into the hot pressed brick structure. Additions such as silica and quartz are used to make this hot pressed carbon more alkali resistant. Normally, alkali materials such as sodium and potassium react with normal carbon to form damaging lamellar compounds that swell, causing volume expansion and spalling of the carbon. However, these alkali materials react preferentially with the silica addition in hot pressed carbon and form compounds that do not swell, avoiding damaging volume expansion or spalling. Hot pressing results in a higher thermal conductivity than conventional carbon, which makes this special hot pressed carbon a very successful metallurgical furnace hearth wall lining material. This is because the higher thermal conductivity of the lining maintains a hot face temperature that is below the solidification temperature of the metal and slag, allowing the formation of a protective layer (skull) of frozen process materials of metal and/or slag on the hot pressed lining hot face. The solidified layer of metal and slag protects hot pressed carbon from the erosive wear from moving liquids and insulates the carbon, preventing chemical attack. The special hot pressing manufacturing process limits the size of these pressed carbon bricks to 450 mm x 250 mm x 115 mm. The term graphite, also called synthetic, artificial, or electro-graphite refers to a carbon product that has been additionally heat treated at a temperature between 2400 deg C to 3000 deg C. This process is called graphitization, which changes the crystallographic structure of carbon and also changes the physical and chemical properties. Graphite is also found in nature. This natural graphite is found in flake form and, if used in a refractory product, is usually part of a mixture with ceramic material or used for the binder. However, clay or ceramic bonded, natural graphite containing refractory is considered a ceramic product. Synthetic graphite refractories begin as a baked carbon material, similar in manufacture to the carbon refractory material. However, after carbonizing of the binder is completed, this baked carbon is then loaded into another furnace to be high-temperature-treated for graphitization. This graphitization changes the structure of not only the carbon particles, but also the binder. The resulting product contains graphitized particles as well as a graphitized binder. There is no industry-wide system for designating the various grades of graphite that are commercially available. Each manufacturer has its own method and nomenclature to describe the available grades and varieties that are made for specific purposes or properties. These grades differ in their raw materials, grain sizes, purity, and density etc. For denser versions, the porosity of the material can be filled with additional binder materials such as tar or pitch by impregnation under a vacuum. The impregnated material can then be re-graphitized, forming a denser and less porous product. Multiple re-impregnations / graphitizations can be performed to provide additional densification. Purification can also be utilized to reduce the ash levels of graphite for high purity requirements. Additionally, proprietary manufacturing methods and techniques can also be utilized to minimize ash or iron contamination of graphites. Iron is a catalyst for oxidation of graphite in a carbon monoxide environment, so graphite intended for use as a refractory should contain relatively low ash and iron contents. The term semi-graphite is used to describe a carbonaceous product that is composed of artificial graphite particles, mixed with carbonaceous binders such as pitch or tar, and baked at carbonization temperatures of 800 deg C to 1400 deg C. The resulting product is composed of carbon bonded graphite particles, in which the graphite particles were manufactured at temperatures close to 3000 deg C, but the binders have only been baked at the 800 deg C to 1400 deg C range. The resulting product, a true carbon bonded graphite, is called semi-graphite. Semi-graphite exhibits higher thermal conductivity than the carbons, but because of its carbon binder, not as high as 100 % graphite. Thermal conductivities of any carbonaceous product varies with baking temperature and can be increased by re-baking at higher temperatures. Semi-graphites can also be densified for graphite and re-baked to carbonize the newly impregnated binder, reducing porosity and consequently permeability. The hot press method of manufacturing brick as described under hot pressed carbon, can also be used to make true semi-graphite products, utilizing graphite particles combined with carbon binder and other proprietary ingredients. The term semi-graphitized refers to a baked carbon that has been additionally heat-treated at a temperature of between 1600 deg C to 2400 deg C. This high temperature baking process begins to change the crystallographic structure of the carbon and alters its physical and chemical properties. However, because this additional heat treating occurs at temperatures below graphitization temperatures, the product is called semi-graphitized. This product contains carbon particles and a carbon binder that are both semi-graphitized. This is different than a semi-graphite product that is composed of graphite particles with a carbon binder. The resultant semi-graphitized carbon, in which both particles and binder are semi-graphitized, provides a material with higher thermal conductivity and chemical attack (from alkali or oxidation) resistance than either carbon or semi-graphite materials. This is because alkalis and zinc attack the binder material first and the semi-graphitized binder is more resistant to attack than the carbon binder of semi-graphite. Carbon and graphite have limitations with regard to oxidation (burning). In air, particulate carbon burns rapidly at 500 deg C and in pure oxygen at 400 deg C and in CO2 in excess of 600 deg C. Combustion of carbon in CO is not possible, which is an important consideration in steel making. Hot steel-making furnaces lined with carbon-bearing refractory brick can be severely deteriorated in a short period of time when not protected from air. Similarly, carbon or graphite electrodes in electric arc furnaces exposed to air, CO2, or other oxidizing agents while hot will oxidize, which is the principal cause of deterioration. The idea of adding carbon to a magnesite refractory originally stemmed from the observation that carbon is not easily wetted by slag. Thus, one of the principal functions of carbon is to prevent liquid slag from entering the brick and causing disruption. Until the mid 1970s, bricks based on carbon in combination with magnesite were mainly used in basic oxygen steelmaking furnaces; but since that time they have been more broadly utilized in electric arc furnaces and steel ladle applications. 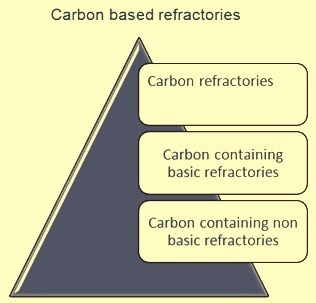 Carbon-containing basic brick can be categorized as (i) pitch-impregnated, burned magnesite brick containing about 2.5 % carbon, (ii) pitch-bonded magnesite brick containing about 5 % carbon, and (iii) magnesite-carbon brick containing 8 % to 30 % carbon (carbon contents ranging from 10 % to 20 % are most common). One category of burned pitch impregnated magnesite brick is made with a dicalcium silicate bond. Dicalcium silicate has an extremely high melting point of about 2130 deg C. Use of this bond in combination with tight chemical control of other oxides gives these bricks excellent hot strength. The carbon derived from the impregnating pitch when the brick is heated in service prevents slag constituents from chemically altering the dicalcium silicate bond, preserving the hot strength and high refractoriness. The carbon also prevents the phenomenon of peel spalling, where the hot face of a brick cracks and falls away due to slag penetration in combination with temperature cycling. Dicalcium silicate bonded burned magnesite brick that have been impregnated with pitch are used in a number of applications. In basic oxygen furnaces, this type of brick is sometimes used in charge pads, where its high strength enables it to resist cracking and disruption caused by the impact of steel scrap and liquid metal being added to the furnace. These brick are also widely used as a backup lining behind the main working lining of a basic oxygen furnace. These bricks are also used in sub-hearths of electric arc furnaces. however, not all pitch impregnated burned magnesite bricks are dicalcium silicate bonded. One important class of brick that deserves mention has a low lime to silica ratio and a high boron oxide content. These chemical features cause the brick to have relatively low hot strength, but at the same time, result in very good hydration resistance. These bricks are used where there is potential for hydration to occur. Pitch-bonded magnesite bricks are used in various applications, but mainly in basic oxygen furnaces and steel ladles. These bricks have excellent thermal shock resistance and high temperature strength, and good slag resistance. These bricks were the principal working lining materials for basic oxygen furnaces for many years. Although in severe service environments they have been replaced to a large extent by more erosion resistant graphite-containing magnesite- carbon brick, they continue to play an important role in, for example, lower wear areas of basic oxygen furnaces. The high carbon contents of magnesite-carbon bricks are generally achieved by adding flake graphite. The high oxidation resistance of flake graphite contributes to the reduced erosion rates of these brick. In addition, the flake graphite results in very high thermal conductivities compared to most refractories. These high thermal conductivities are a factor in the excellent spalling resistance of magnesite-carbon brick. By reducing the temperature gradient through a brick, the high thermal conductivities reduces the thermal stresses within the brick. High thermal conductivity also results in faster cooling of a magnesite-carbon brick between heats and thus reduces potential for oxidation. In recent years, product development efforts have been directed towards producing magnesite-carbon bricks with good slag resistance and high temperature stability. High temperature stability refers to the ability of the brick to resist internal oxidation-reduction reactions that can reduce hot strength and adversely affect the physical integrity of the brick at elevated temperatures (i.e. the oxides in the brick are reduced by the carbon). A high degree of slag resistance and good high temperature stability have been found to be advantageous in the hotter and more corrosive service environments. The high temperature stability of magnesite-carbon brick has been achieved by utilization of high purity graphites and magnesites. Since flake graphite is a natural, mined material, there are impurities associated with it. These may be minerals such as quartz, muscovites, pyrite, iron oxides and feldspars. Although much purification is accomplished through flotation processes, most flake graphites contain a limited amount of these impurities. These mineral impurities are often referred to as graphite ash. Some of the ash constituents, especially the silica and iron oxide, are easily reduced by carbon and thus result into a loss of carbon from the brick and a reduction in hot strength at elevated temperatures. Magnesia can also be reduced by carbon at high temperatures. For best high temperature stability, high purity magnesites are used. Magnesites with very low boron oxide contents are especially desirable. The service environments, in which these carbon containing basic bricks are used, are very diverse due to process changes in the steelmaking industry and due to broader use of the products. A great deal of work has been done to develop special additives to improve the performance of carbon-containing brick in these applications. These additives include powdered metals such as aluminum, magnesium and silicon. One reason for adding these metals is to improve oxidation resistance. The metals consume oxygen that otherwise oxidize carbon. The aluminum and silicon also cause the pore structure of a magnesite-carbon brick to become finer after the brick is heated. It is believed that the pores become finer due to formation of aluminum carbide (Al4C3) and silicon carbide (SiC) by reaction between the metals and the carbon in the brick. The finer pores result in decreased permeability of the brick and inhibit oxidation by making it more difficult for oxygen to enter the brick structure. Another reason for adding metals is to improve the hot strength of magnesite-carbon brick. It has been suggested that the improvement in hot strength is due to the formation of carbide bridges within the matrix of the magnesite-carbon bricks. Another way that metals may improve hot strength is simply by protecting the carbon bond in these brick from oxidation. Silicon has been employed as an additive to inhibit the hydration of aluminum carbide that is formed in aluminum-containing magnesite-carbon brick. Aluminum carbide can react with atmospheric humidity or any other source of water to form an expansive reaction product that can disrupt the brick. This is illustrated by the equation: Al4C3+12H2O = 3CH4+ 4Al(OH)3. This reaction represents a potential problem for applications with intermittent operations such as some steel ladles or electric arc furnaces. Adding silicon to an aluminum- containing brick greatly extends the time before which the hydration occurs. Boron-containing compounds such as boron carbide (B4C) are used to improve oxidation resistance in certain critical applications such as tuyere elements in bottom blown basic oxygen furnaces. In addition, magnesite-carbon brick are sometimes impregnated with pitch in order to improve oxidation resistance as well as to promote brick to brick bonding in service. Dolomite brick are also made in carbon-bonded compositions. The carbon-bonded varieties include both pitch and resin-bonded alternatives. Some of the carbon-bonded bricks contain flake graphite and are somewhat analogous to magnesite-carbon brick. Alumina carbon bricks are high alumina bricks which are usually bonded by a thermosetting resin that yield a carbonaceous bond. These bricks contain a carbonaceous ingredient such as graphite. Graphite containing alumina refractories are used to a great extent for the continuous casting of steel. For this applications, a carbon content of 30 % is widely used. In addition to the graphite additive, the bond is also out of carbon. The carbon bond is obtained by the coking of synthetic resin or pitch and give the product a superb thermal shock resistance. The ladle tundish shroud serves as a cast stream protection between ladle and tundish. It is usually manufactured out of alumina- graphite. Other uses of carbon bonded alumina refractories are submerged entry nozzles and monobloc stoppers. Alumina carbon refractories fulfill a number of essential and partially contrasting demands of steel casting. The most important demands are high corrosion and erosion resistance, low wettability against steel and slag melts, high thermal shock performance, as well as high mechanical strength and oxidation resistance at elevated temperatures.